Around 90% of the animals are confiscated from wild animal traffickers by the local Forest Protection Agency in HCM City. The remaining 10% are voluntarily handed over by breeders. Animals at the centre include pangolins, iguanas, water-rats, gibbons, Malayan bears, many-coloured boas, sloth-monkeys and tortoises. According to WAR, popular diseases caught by confiscated wild animals are exhaustion or having injuries because they are confined in poor conditions. Other animals can have infectious diseases in nature so they must be isolated for quarantine for at least three months. It is up to 6 months in isolation for ill reptiles. At present 130 breasts are at the rescue centre, accounting for 48%. 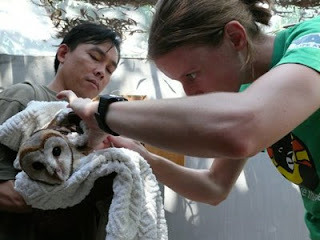 The remaining have been released to the forest, transferred to other rescue centers or to suitable preservation zones.